An Italian plumber that eats magic mushrooms, dresses up in freaky costumes and jumps on the heads of poor defenceless turtles… someone should inform the authorities! 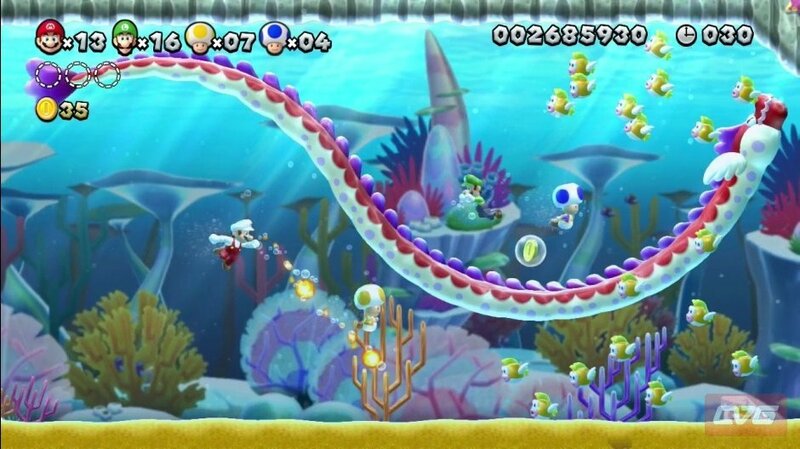 With the launch of Nintendo’s new home console, the Wii U, comes a brand new Mario game, New Super Mario Bros U. 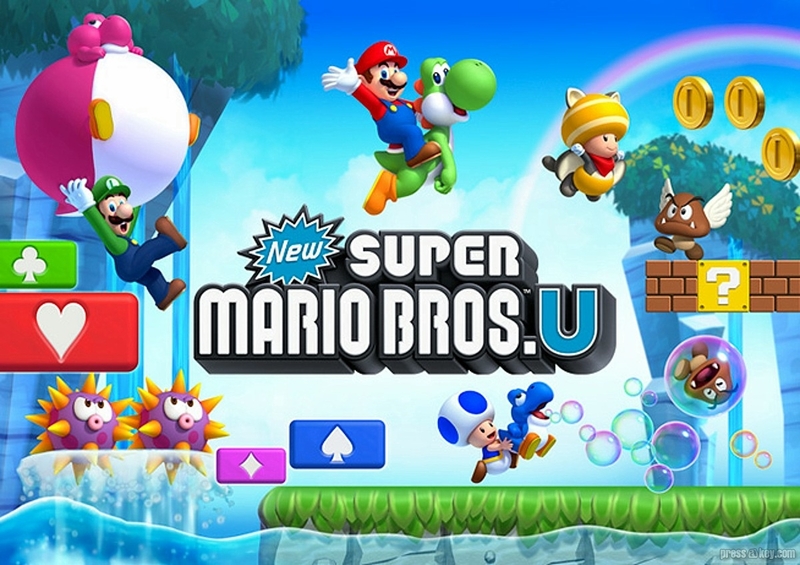 The plucky plumber’s first ever outing in high definition, New Super Mario Bros. U is also the first Mazza title to be launched with a Nintendo console since Super Mario 64, and the first platforming title to ship with a console since Super Mario World. A 2.5D platformer, the game features new more detailed background styles than ever before and introduces a fresh power-up, the Super Acorn, that transforms our favourite moustached mushroom-muncher into a flying squirrel. As per usual the story to New Super Mario Bros. U is incidental. Mario, Luigi and the Toads are in Princess Peach’s castle noshing on some royal grub, when suddenly Bowser shows up in his airship. Using a gigantic robotic arm he hurls Mario, Luigi and the Toads across the Mushroom Kingdom towards the Acorn Plains. After crashing into an oak tree, launching Super Acorns throughout the region, Mario and company are forced to embark on a quest to travel across this strange new land, in order to get back to the castle and rescue the imprisoned Peach. I swear that broad is more trouble than she’s worth! The Fire Flower, Ice Flower, Penguin Suit, Propeller Mushroom and Mini Mushroom make a welcome comeback, but the game also features a new power-up, the Super Acorn. This item gives Mario and company a Flying Squirrel Suit, which allows them to gracefully glide through the air, as well as grab onto and push off walls. Furries will undoubtedly go mental for this one! Unlike previous New Super Mario Bros games where each world was separate from the next, akin to Super Mario Bros 3, New Super Mario Bros U has a seamless world map with the different areas named after various foods and drinks, similar to that of Super Mario World. 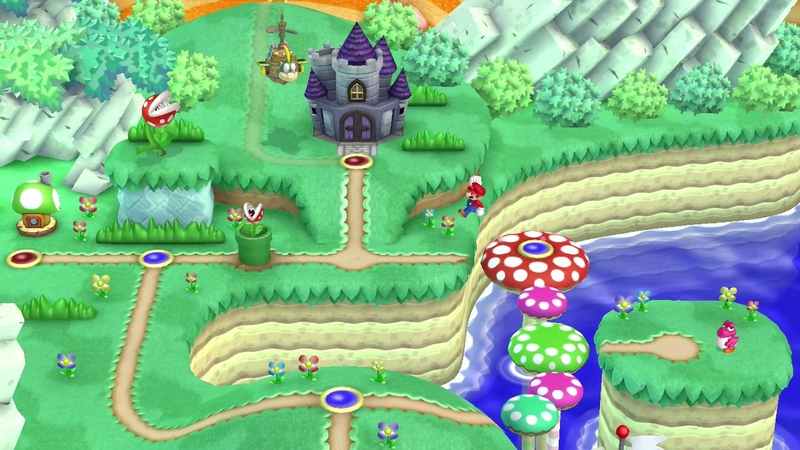 As in previous games there are Toad Houses, Enemy Courses, Fortresses, Castles and Ghost Houses scattered throughout the different regions. Worlds range from Layer-Cake Desert – a sprawling desert world made up of various desserts such as melting ice creams and giant cakes, to Sparkling Waters – a tropical world with multiple islands, bubbling geysers, and even a sunken ship. The world map inventory from New Super Mario Bros. Wii is back. Unlike previous incarnations however, this one is limited to ten items only. Items are accrued by playing Red Toad House mini games, finding them on the world map itself and by merking fools in Enemy Courses. 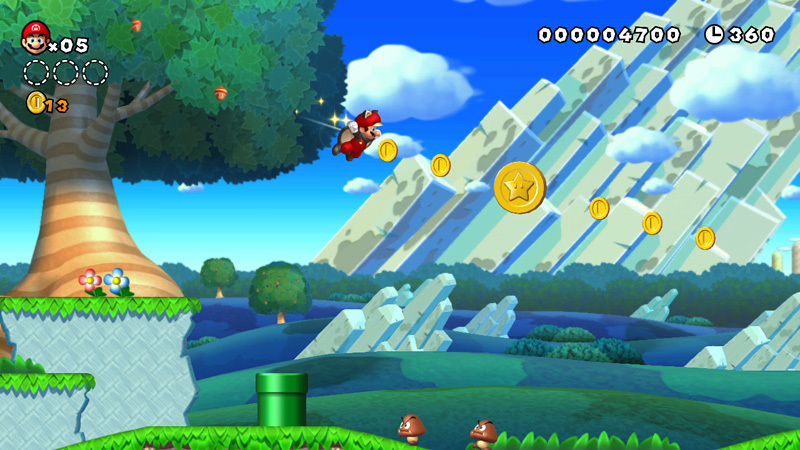 As well as being played on a television screen New Super Mario Bros. U can also be experienced directly on the screen of the Wii U Gamepad, thereby allowing other members of the household to watch TV without the player being forced to stop. This could potentially avoid arguments that could lead to sticky incidents with the police and a sensation piece in the paper the next day. As well as the main adventure, there are a couple of other game options to choose from. Challenge Mode, where players have to complete various objectives, some with a time limit. Boost Rush Mode, where players have to reach the end of two or three selected stages while the level auto-scrolls, speeding up every time a coin is collected. And finally Coin Battle Mode, where players have to scramble in order to grab more coins than their competitors. I am a self-confessed Nintendo Kid. I’m not a fan-boy per se. I am objective and I do recognise Nintendo’s faults – of which there have been many over the last few years – but I’m still a huge fan none-the-less. I grew up with Nintendo consoles and their franchises, and Super Mario has always been a huge part of my life. I know a lot of people were fairly down on New Super Mario Bros Wii. Not because it wasn’t a great game but because it played it safe, failed to significantly innovate and lacked any real difficulty. Personally I still really enjoyed blazing through it with my cousin in co-op and as I’m not hugely into portable gaming I haven’t been saturated in Mazza titles like DS/3DS owners have as of late. Even bearing all that in mind, I am STILL totally jazzed for New Super Mario Bros U. I’ve pre-ordered my Wii U and bought a few more Wii Remote Plus’ in anticipation for this Xmas, when my friends and family are going to get together, don some party hats and get pissed up, mucking about with Mario until we all pass out from eating too much Xmas dinner. It’s-a going to be great! Waaaaaahooooo!!! New Super Mario Bros. U is released on 30th November exclusively on the Wii U.